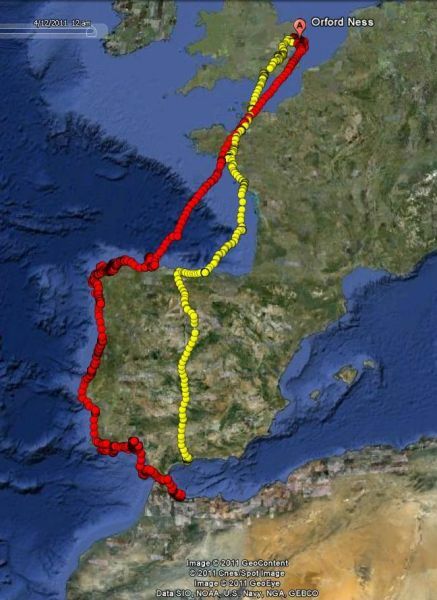 The BTO has been tracking breeding Lesser Black-backed Gulls since 2010. This species was classed as "Amber" in the most recent Birds of Conservation Concern, and large declines have been reported at several important breeding colonies where it is protected. It is therefore important to assess how it might respond to changes to its environment, such as those brought about by the construction and operation of offshore wind farms. We first tagged birds breeding at the National Trust's Orford Ness NNR on the Suffolk Coast, before expanding the project to include birds breeding on Skokholm Island off the coast of Pembrokeshire, and South Walney in Cumbria. The Lesser Black-backed Gull is protected at all three sites, and offshore wind farms are proposed or are already in operation close to each. This project is funded by the Department of Energy and Climate Change, and is using state of the art GPS tags manufactured by scientists at the University of Amsterdam to explore how this species might interact with offshore wind farms. These tags are solar powered and download data automatically when birds move to within a few kilometres of a mast located at their breeding colony. In addition to the gulls’ position, the tags transmit data about their altitude and acceleration. In addition to revealing breeding season movements, we have also uncovered fascinating information on the migratory and wintering behaviour of our tagged birds. Read our paper in Journal of Applied Ecology about seabird flight heights and implications for collisions with wind farms. Read our paper in Biological Conservation about the long-term use of wind farm areas by Lesser Black-backed Gulls. Find out what we learned when our gulls came back in 2013. Read our update on our first gulls back in 2012. Download our second year report. Download our first year report. 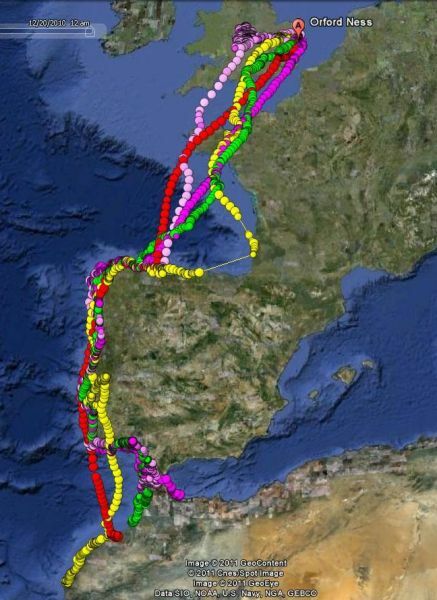 on the first year wintering movements of our gulls. about the project in its fourth summer. For further information, please contact viola.ross-smith [at] bto.org (Viola Ross-Smith) or chris.thaxter [at] bto.org (Chris Thaxter).